This 2 Person Square Bucket Survival Kit is designed to sustain two people for 3 days (72 hours) in the event of a disaster or emergency. 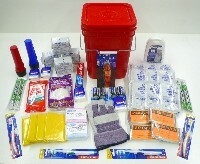 Packed in a red square plastic bucket with lid and carry handle, this 2 Person Emergency Kit is 72 hour rated per FEMA and other government agency guidelines. The pre-molded lid allows for easy stacking of several Survival Buckets.